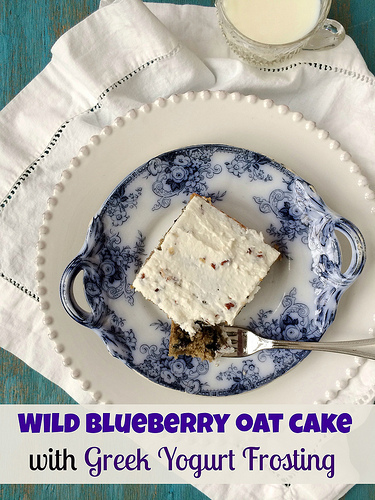 This wild blueberry cake is made with whole grain oats and a homemade Greek yogurt frosting that’s a lot healthier than traditional cream cheese frosting. 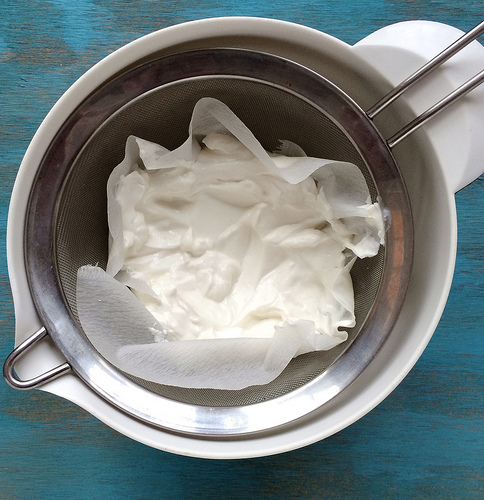 Learn how to make Greek yogurt frosting. It’s a whole lot healthier than cream cheese frosting and tastes just as good … if not better! I love cake and my kids love it too, and since my boys are teenagers, they can eat A LOT of cake in one sitting without thinking twice. That’s why I often find myself dreaming up new ways to make cake better. By better I mean lighter in fat and calories, more substantial in terms of good nutrition, and of course, brimming with great flavor. 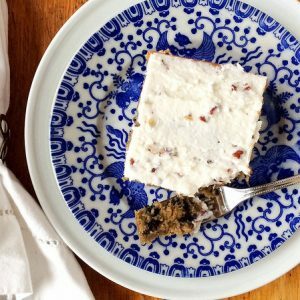 Did I meet all of those meal makeover goals with my new recipe for Blueberry Oat Cake with Greek Yogurt Frosting? Absolutely! The inspiration for this cake came from one of our Facebook fans who asked us to give her family’s favorite Old-Fashioned Oatmeal Cake with Broiled Topping a healthy makeover. The original recipe called for nearly three cups of sugar, 3/4 cup butter, and white flour. I liked the concept with all the oats but knew I could make it better. 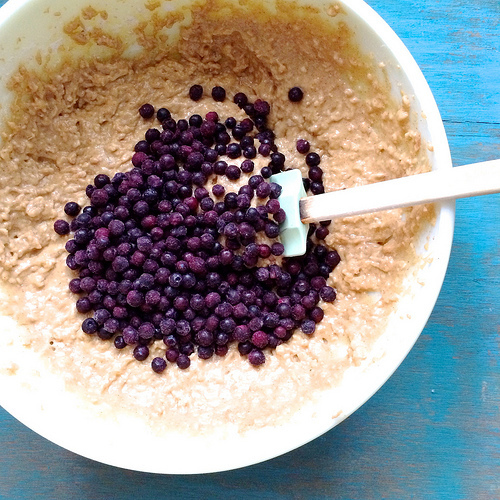 To that end, I cut the sugar to just 2/3 cup, replaced the butter with a healthier oil, created an amazing frosting with 0%-fat Greek yogurt, and added a nutritional boost with frozen wild blueberries. 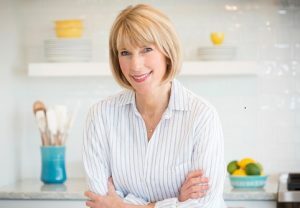 There were no blueberries in the original recipe, but the cake was screaming for a naturally sweet ingredient that could replace some of the sugar. Wild blueberries fit the bill. Did you know they are more nutritious than the larger, cultivated variety? They are also rich in antioxidants, high in fiber, and an excellent source of manganese, a mineral important for strong bones. Wild blueberries are available year round in the freezer section of the supermarket. Instead of making the sugary frosting called for in the recipe or using cream cheese, I created a super-healthy frosting with 0%-fat vanilla Greek yogurt. I got the idea for the Greek yogurt frosting from Regan Miller Jones of Healthy Aperture. Place a coffee filter inside a sieve ( I have small filters, so I split two of them in half). Spread the Greek yogurt evenly over the filter, cover loosely with plastic wrap, and place in the refrigerator overnight. When you’re ready to make your frosting, pour off the drained whey and reserve it for later use such as adding to smoothies (I had about half a cup), scrape the yogurt from the filter, place the yogurt in a clean bowl and then, in the case of my recipe, stir in chopped pecans, flaked, unsweetened coconut, and just 1 tablespoon of powdered sugar. 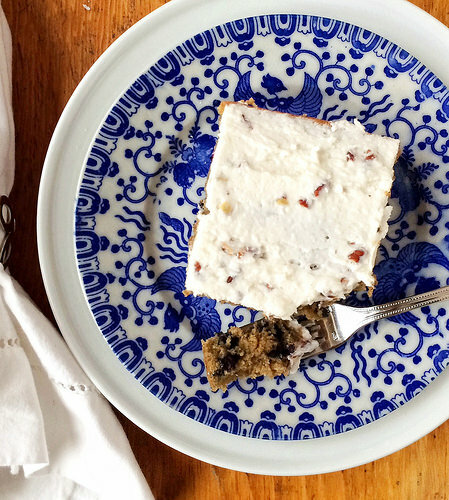 This cake is so healthy, you can serve it as a snack or a dessert ... and even at breakfast. 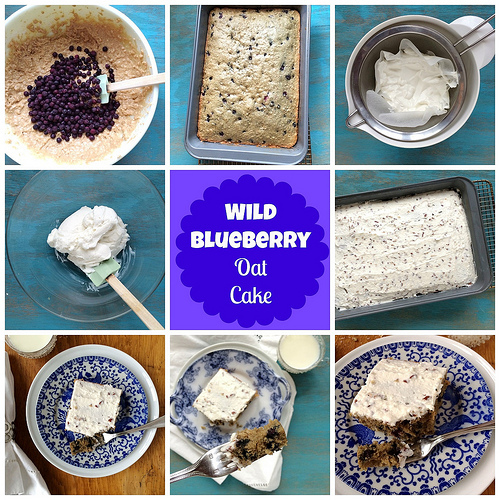 With the addition of oats, whole wheat flour, canola oil, wild blueberries, and a Greek yogurt frosting, it brings plenty of fiber and nutrition to the table. To make the yogurt frosting, you'll need to drain the Greek yogurt overnight. So plan ahead for this step! Place the oats and boiling water in a bowl and stir to combine. Let stand 20 minutes. Meanwhile, preheat the oven to 350˚F. 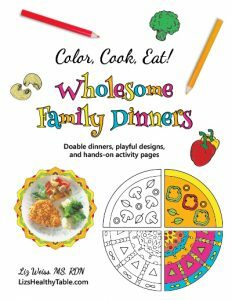 Lightly oil or coat a 9 x 13-inch baking pan with nonstick cooking spray and set aside. Place the granulated sugar, brown sugar, and canola oil in a large bowl and beat together with an electric mixer until well combined. Scrape down the sides of the bowl as necessary. Beat in the eggs, lemon zest, lemon juice, and vanilla until well blended. Slowly beat in the soaked oats until combined. Add the all-purpose flour, whole wheat flour, cinnamon, baking soda, baking powder, and salt and beat until just combined. Stir in the wild blueberries. Arrange the batter evenly in the prepared pan. Bake about 30 minutes, until a toothpick inserted in the center comes out clean. Cool completely. To make the frosting, you'll need to start the process the day before you frost your cake. Place a coffee filter inside a medium-size sieve ( I have small filters, so I split two of them in half). Spread the Greek yogurt evenly over the filter, cover loosely with plastic wrap, and place in the refrigerator overnight. Place the sieve over a bowl. When you're ready to make your frosting, pour off and reserve the drained whey and use later in smoothies, etc (I had about half a cup), scrape the yogurt from the coffee filter, place the yogurt in a clean bowl, and stir in the chopped pecans, flaked, unsweetened coconut, and the remaining tablespoon of sugar as desired. You did a great job making turing the original recipe into a healthy recipe. I especially like what you did with the frosting. Frosting always seems to be a challenge for me. Your yogurt frosting sounds perfect for this cake! What a great makeover! 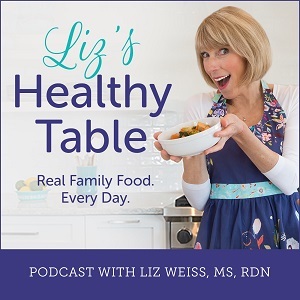 I love how you reduced the sugar so much-sure it tastes even better that way 🙂 My kids aren’t quite teenagers yet, but I’m amazed at how much 2 active Tweens can eat too!!! I’m typically not a big cake eater, but this cake may change that! 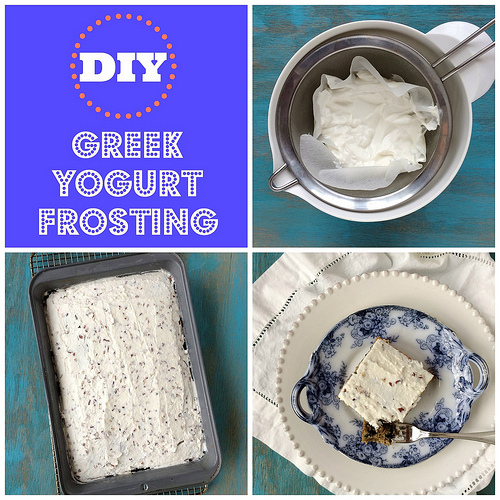 Love the idea of making a greek yogurt frosting! Sounds scrumptious! I recently tried Regan’s Greek yogurt frosting too — so smart! I don’t like normal frostings (I hate how gritty with sugar they feel, blech) but a thick and creamy Greek yogurt frosting I just have to try. sounds so tasty! Well this looks fantastic! 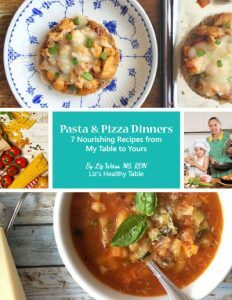 I have all the ingredients for this, so I can make it ASAP! Enjoy. Let us know how it turns out! Swapping the oil for an equal amount of unsweetened applesauce is an easy trick to cut fat! Making the frosting right now. Did you put the sieve in the fridge over a plate or a bowl? I’m wondering if a plate will overflow with whey? Can’t WAIT to try this frosting!! In fridge over a bowl. I’ll add that to the post. Thanks Serena. Enjoy! !